I came into gardening through the kitchen door. I loved to cook long before I began gardening, and while my yard does have a lot of annuals, perennials, shrubs and trees, the plants that I feel most attached to are food plants — tomatoes, cherries, green beans, even cucumbers. That is not to say that my vegetable garden is meticulously kept. I tend to over plant and to locate it in full sun, it had to be placed a bit far from the house and too close to a city-owned field, which means grassy weeds are a constant hassle. Still, when I get my hands on fresh food whether I grew it or someone else, I am happy. Saturday was a perfect day to stay indoors and cook, and I had plenty of food from my garden, the local apple orchard and the farmers’ market. 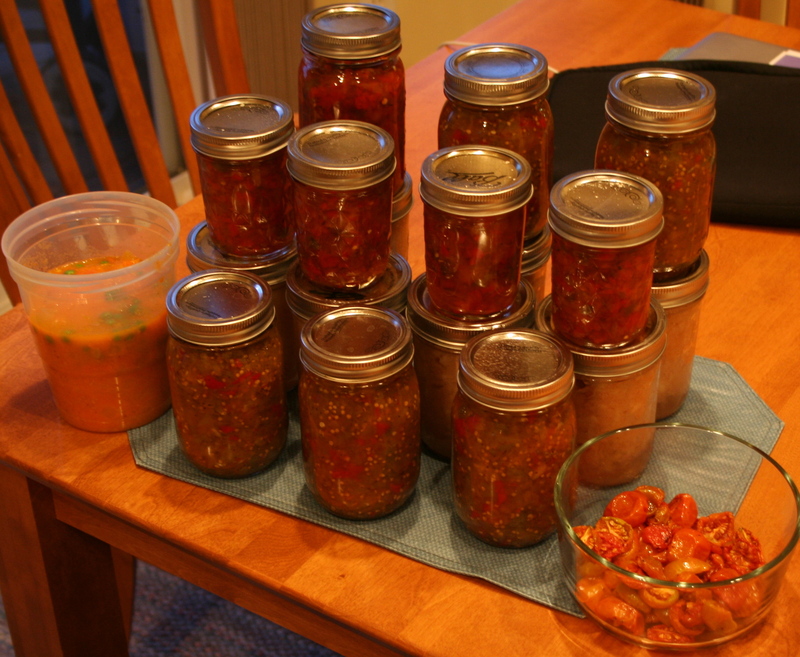 I ended up making 7 pints of applesauce 6 half-pints of red pepper relish, 5 pints of green tomato relish, a small batch of roasted tomatoes, a pan of tomato sauce and baby back ribs for supper. I was going to make an apple crisp, too, but knew that my husband and I were going to have pie on Sunday so decided to hold off on the sweets. The key to doing a big day of cooking (other than a good night’s sleep the night before!) is to get the biggest bits of work done early and to start anything that requires a waiting time first. So I cut up and put the tomatoes to roast first, then chopped all the vegetables for the relishes and set them aside, because each recipe requires 3-plus hours of marinating. Then I cut up the apples (the most tedious job of the day) and made and canned the applesauce. Later I made and canned the two relishes, put the ribs in the oven after the tomatoes came out, and lastly made the tomato sauce. Once you get your canner going, it’s not that much harder to can more than one item. I wish I could say I had everything on hand and was ultra-organized about my cooking day, but the truth is I made two trips to the grocery store because I forgot things. I also will say that my youngest child is 20-years-old and my husband does 90 percent of the laundry around here — in other words, I’m in a situation where a day in the kitchen is easy to arrange. And, it’s a great joy. I love to see all my canning jars filled, and roasted tomatoes ready for salads this week and a jug of sauce for pasta some night when I don’t feel like cooking. I’ve noticed that many gardeners tend to be good cooks, and many good cooks like to garden. Whether you come to gardening through the kitchen door or to cooking through the garden gate, it hardly matters. You’re in a good place either way.